May and other rituals, happening (with the Group PAN 69), May 24th Festival of Student Theatre, Theatre ITD, Zagreb, 1970. Banner with the text “Adjo loves Stipa” in Stančićeva Street during May 1st holiday, Zagreb, 1975. A line drawn in the red acrylic across the grass during the exhibition – action of the Group of Six Artists at the swimming area on SavaRiver, Zagreb, 1975. 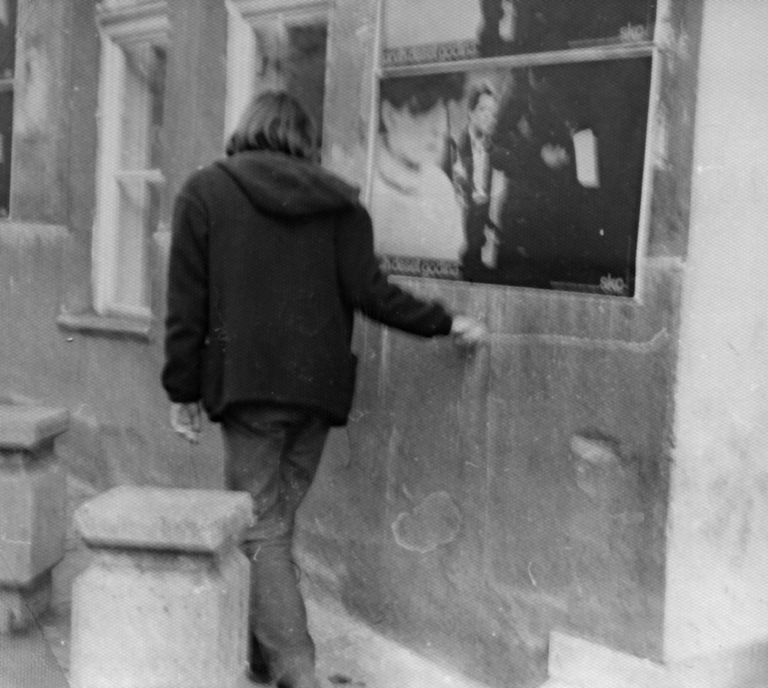 Photo-intervention – photos with the text “grass”, “grass”, “Walking on the pavement prohibited” are glued on the pavement during the exhibition – action of the Group of Six Artists in New Zagreb, 1975. The text “writing”, “writing” written in chalk on the road, during the exhibition – action of the Group of Six Artists at the Jesuits Square, Zagreb, 1975. Projection of slides with the text “This is mine” on houses, people, cars, pavement, trees, etc. during the exhibition – action of the Group of Six Artists at the Jesuits Square, Zagreb, 1975. 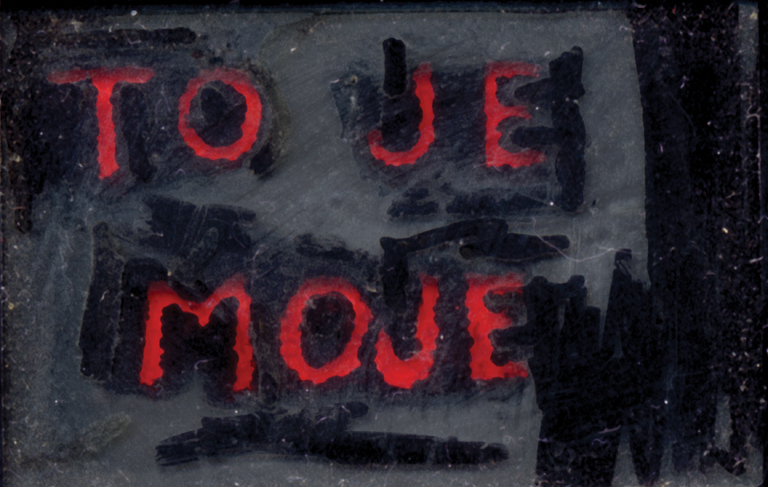 Projection of the slides “Rooms”, “Zimmer frei”, “Camere” on the houses in the vicinity and on St Catherine Church during the exhibition – action of the Group of Six Artists at the Jesuits Square, Zagreb, 1975. Distributing photos of a model’s smile from Burda magazine for women and gluing them on the pavement at the tram stop during the exhibition – action of the Group of Six Artists at the former Republic Square, Zagreb, 1975. Photo intervention – some 50 photos of a clock showing different time glued in different rhythms to the floor and the staircase at the Student Culture Centre during 5th April Meetings, Belgrade, 1976. Action Red as a Present, Student Culture Centre during 5th April Meetings, Belgrade, 1976 (a painting given to Raša Todosijević). Action Auction of Red Student Culture Centre during 5th April Meetings, 1976, Belgrade (a painting sold to Biljana Tomić for DIN 100,00). 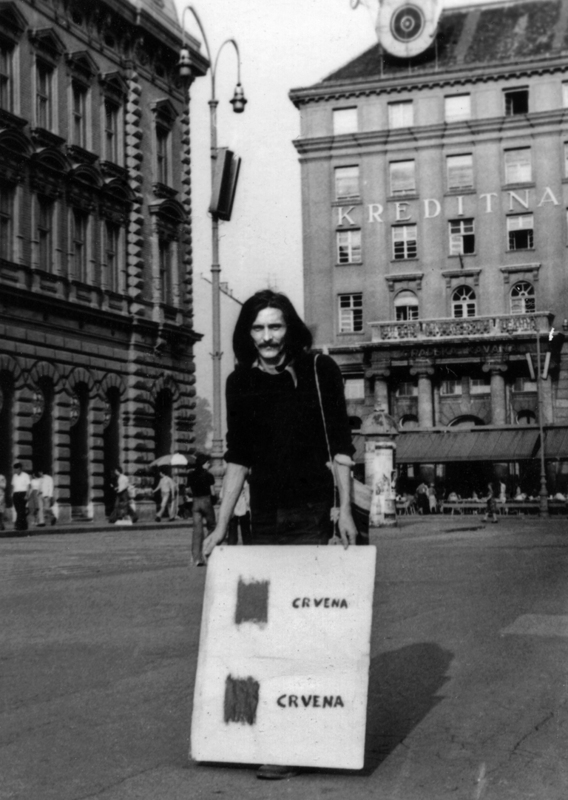 Action of carrying a painting (Two Reds) during the exhibition – action of the Group of Six Artists while walking through Zagreb, 1976. Texts “red at sea”, “red in the sea” written with a felt pen on plastic foils placed above and into the sea. Texts “red” written on pebbles. Attempts to catch sea foam. All actions performed during the exhibition-action of the Group of Six Artists on the beach in Mošćenička Draga, 1976. Action For U. M. – consisting of throwing a pebble with inscribed name in the sea. 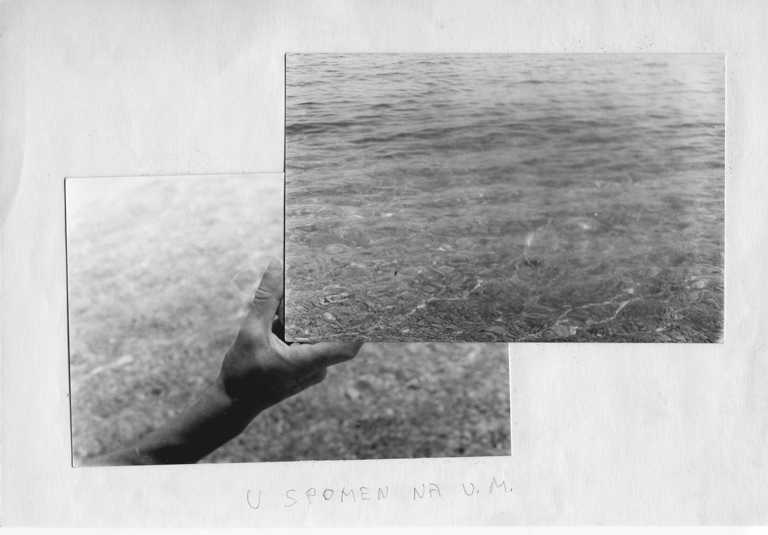 Self- censored dedication and a secret, ephemeral monument during the exhibition-action of the Group of Six Artists on the beach in Mošćenička Draga, 1976. Red at the Biennale – a short action at the opening of the Venetian Biennale consisting of a 10-second exhibition of a small piece of paper with the text written in red pen “Red at the Biennale”, Venice, 1976. In the environment Art is…, at the Gallery of Contemporary Art – sitting at the table in a room full of definition on art written on the sheets of paper hung on the walls, the artist wrote with his own blood sentences such as “I bleed over this book”, “words written in blood”, and continued with more pathetic ones “my life written in blood”, “all is blood” , which are linked in the traditional artist jargon to creative process; during the exhibition – action of the Group of Six Artists, Zagreb, 1977. Red Dust – showing a film tape which was dragging on the floor collecting dust during the exhibition – action of the Group of Six Artists, Gallery of Contemporary Art, Zagreb, 1977. Prepared and exhibited the artist’s book Ordine – Disordine, during the exhibition-action of the Group of Six at Piazza della Accademia, Venice, 1978. 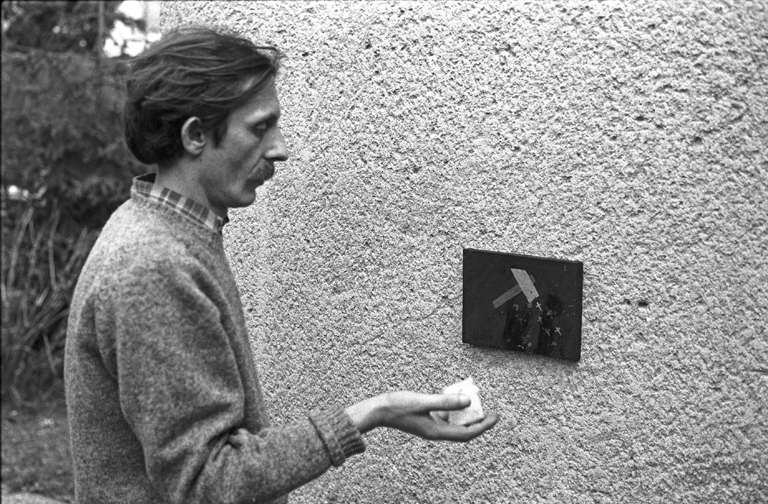 Action Obstruction of the artist in action (turning off Željko Jerman’s TV, hiding Demur’s paperwork), during the exhibition – action of the Group of Six Artists, at the Gallery of the Student Culture Centre, Belgrade, 1978. A talk offering critique of the use of English in art at the symposium Tendency 6 – Art and Society, Centre for Culture and Information, Zagreb,1978. Lecture The Discourse about Language and about Power and performance The Foot –Bread Relationship, on the occasion of the exhibition Works and Words, De Appel Gallery, Amsterdam, 1979. Distribution of photos with the text “Entrance prohibited to the unemployed” at the exhibition New Photography 3, Gallery of Contemporary Art, Zagreb, 1980. Double Offence – a 10-dinar banknote with the national flag drawn in pastel is sold for twice the value, at the exhibition Bookwork at the Gallery of the Student Centre, Zagreb, 1980. At the solo exhibition Sing! at the Gallery of Contemporary Art, the artist left the last room empty where he would sit from time to time and talk to the visitors, Zagreb, 1980. At the same show the artist realized two environments: Money and Submit to Public Debate. Drew a line in chalk starting with the walls and houses on the street, through the Student Culture Centre and in the Gallery SKC and then the other way round, Belgrade, 1980. Threw a cake at the painting at the solo exhibition Exploitation of the Dead, Gallery of Extended Media (Gallery PM), Zagreb, 1988. Auction of the Red – on the occasion of termination of the Communist Party of Australia (sold to a professor of the School who was a party member), SydneyArtSchool, 1991. 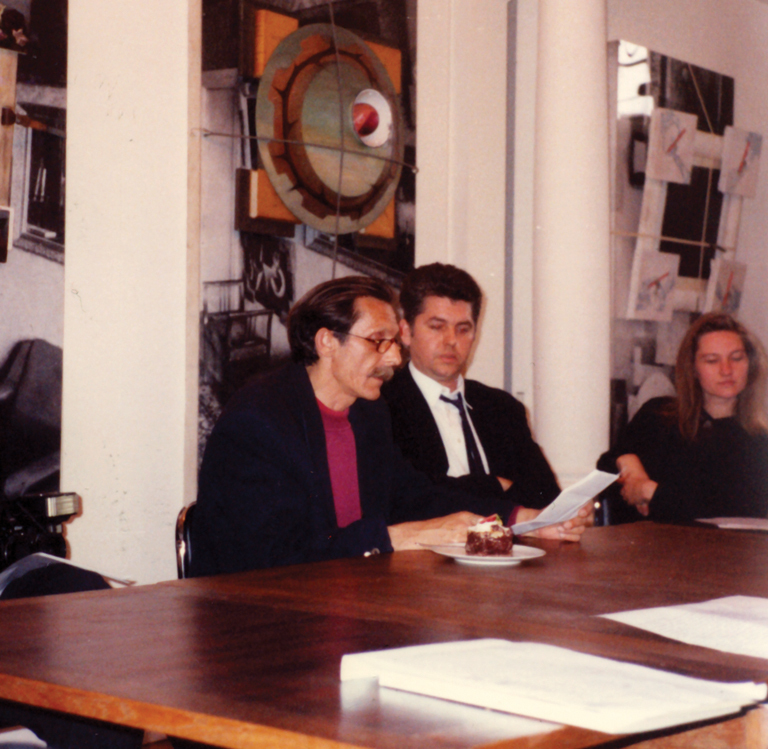 Praise of Laziness – lecture after which he ate a cake, the NSK Embassy in Opus Operandy, Ghent, 1993. Cakes – vanilla custard slices placed on the staircase of the Croatian Association of Artists at the exhibition Food and Drinks, Zagreb, 1994. For Marie Antoinette – intervention on the street with loaves of bread containing cakes, on the occasion of the manifestation Book and Society, Attak and Igor Grubić, Floral Square, Zagreb, 1998. Lecture Fear of Red and Auction of the Red at the exhibition of the Group of Six Artists, Gallery of Art, Split, 1998. 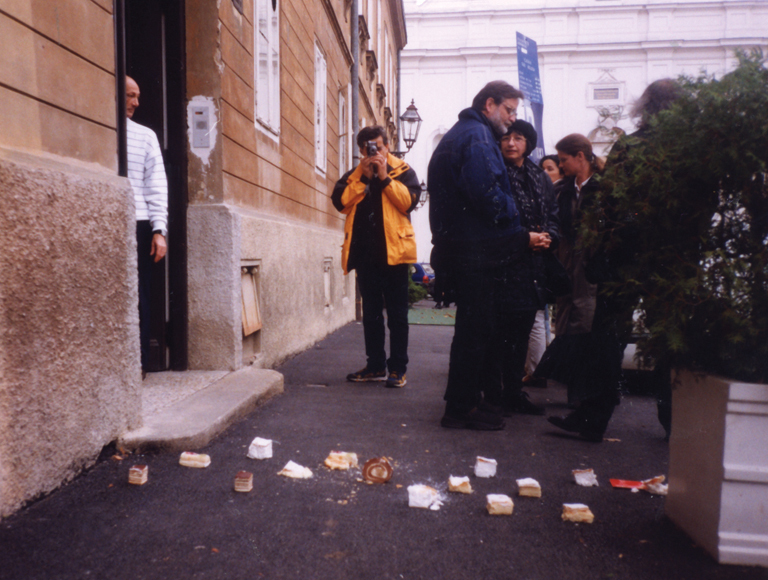 Intervention with cakes that he placed as obstacles on the pavement in front of the Museum of Contemporary Art on the occasion of the exhibition Fluxus, Zagreb, 1999. Lecture Dear Art and action Self-censorship on Sale (sold a work with the text “Self-censorship on Sale” to Miran Mohar) at the exhibition Invaluable – Worthless, Museum of Modern Art, Ljubljana, 2000. 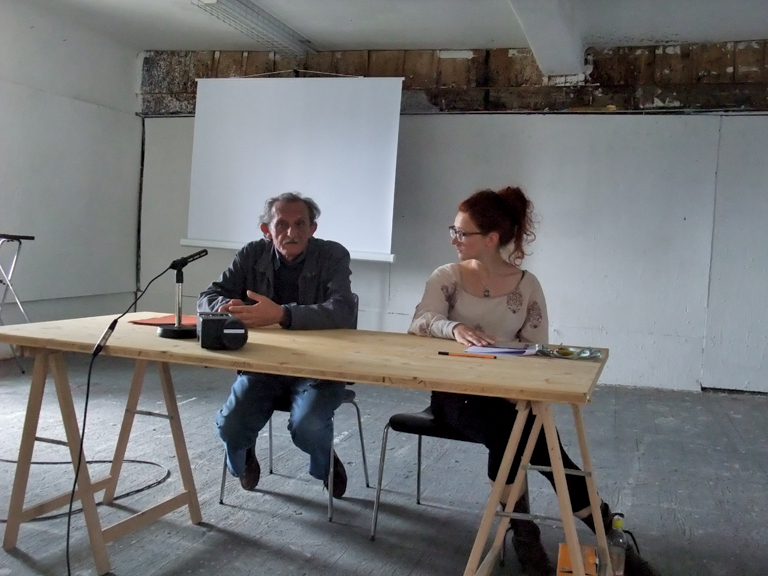 Lecture and action with potatoes on the occasion on the EU entry of Slovenia, Museum of Modern Art, Ljubljana, 2004. Banner with the text “Auge um Auge, Zahn um Zahn, Reklame um Reklame“ (“An eye for an eye, a tooth for a tooth, an advertisement for an advertisement”), on the building of Kunstverein, Graz, 2006. 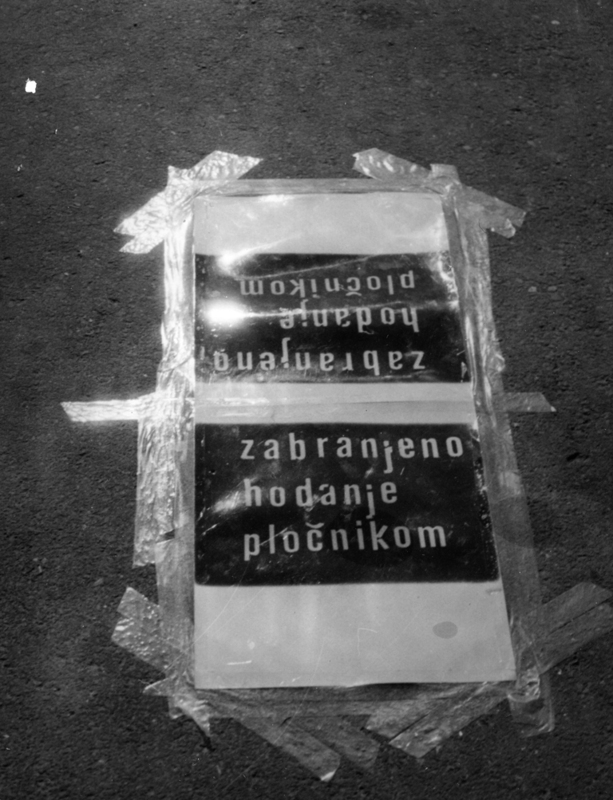 Banner with the text “Sutra” (“Tomorrow”) on the street in Dubrovnik (a sketch from 1975), on the occasion of the exhibition On the Unknown Works, Art Workshop Lazareti, Dubrovnik, 2007. For Marie Antoinette ’68 – intervention on the street with loaves of bread containing cakes and stone blocks from block paving, U-TURN, Copenhagen, 2008. For Marie Antoinette ’68 – intervention on the street with loaves of bread containing cakes and stone blocks from block paving, Operation Town, Zagreb 2008. Erste Bank on Sale – sold a photo with the text “Erste Bank on sale” at the symposium Why here is always somewhere else, Badischer Kunstverein, Karlsruhe, 2008. Beginning (Hommage a Brancusi), public monument during Periferic 8, Biennial for Contemporary Art, Iasi, 2008. Lecture on Tobacco – during the lecture cakes were brought to the artist, Secession, Vienna, 2009. 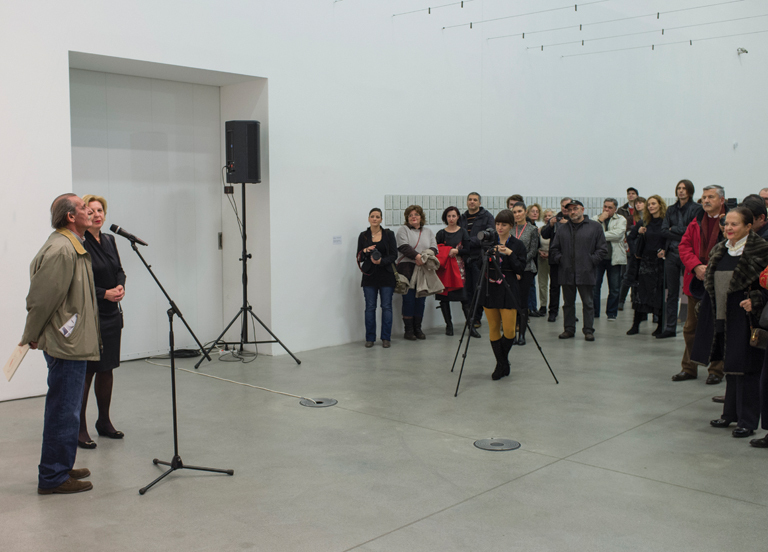 Auction of the work with the text “Hans Ulrich Obrist on Sale” (sold to a student for EUR 5,00) at the conference Július Koller Society, Museum of Modern Art, Bratislava, 2009. 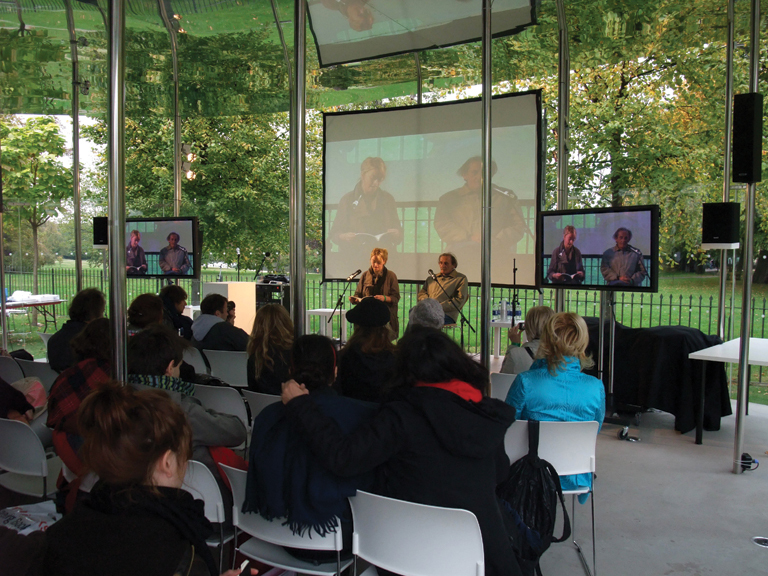 Some ten pages from the work Dictionary–Pain was read aloud by an actress from England at the event Poetry Maraton, Serpentine Gallery, London, 2009. Lecture on Laziness – during the lecture students were reading Stilinovic’s textual works, SummerAcademy, Salzburg, 2012. 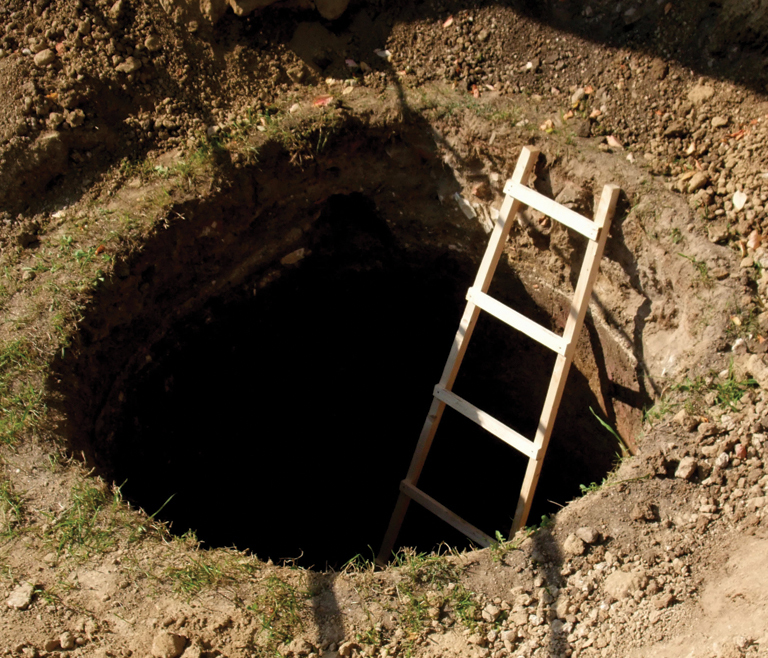 At the opening of the exhibition Zero For Conduct, the artist asked the audience to shout “You failed the test. Sit down!”, Museum of Contemporary Art, Zagreb, 2012.